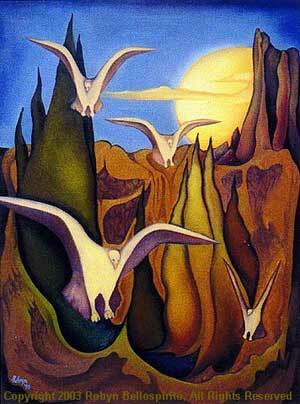 Bird Vibes is a deck of spiritual insight cards based on birds and the chakras. It contains 50 cards of birds, each one different, with a painting by Ottawa artist Heather Bale on one side, and a paragraph of text on the other. The message on each card starts with a fact about the bird, something about its habitat, or what it eats, how fast if flies and so on, and that leads into a spiritual message. There is a title on each card as well that gives a short message like Simplify your Life or Stay in Touch or See the Potential. 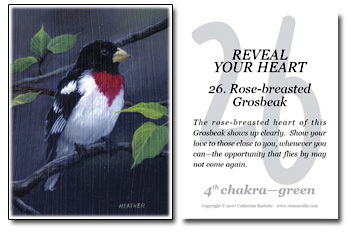 The cards are grouped by eight chakras – seven birds for each of the first seven chakras and one for the eighth chakra. Have you always loved birds? I grew up in Marathon, Ontario, on the shore of Lake Superior, in a village of 1500 people, surrounded by the bush, and I spent summers in Ontario cottage country. My mother knew all the birds and I learned from her without even thinking about it, I would imitate the song I had heard walking home from public school or in the woods, and she would tell me what it was. She impressed me by telling me that individual birds had their own songs and could be told apart, like a Song Sparrow whose neighbour sings a slightly different song. Later I studied birds more carefully, and I enjoy reading bird books of all sorts—I’m a bird lover, not an ornithologist. Why did you do this meditation deck? I’ve always been attracted to birds, since I was little, and they seem to be drawn to me because they come into my life in unexpected ways – needing help, or food, or bringing messages. I wanted to produce this deck in order to bring positive messages to other people, who may not have the time, the inclination, or the physical ability to go out and see the birds. And the feedback tells me that people do feel joy in the paintings, relate to the messages, and appreciate the way in which the message that is just right for them in that moment comes to them when they draw a card at random. When was Bird Vibes published? I started working on Bird Vibes in the fall of 2006 and published my first 200 last May. 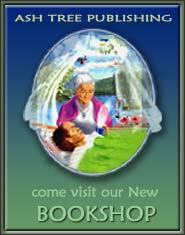 I sold them through my web site and to the independent book stores in Ottawa, as well as a number of other places. People who took Reiki classes with me bought them, and word spread. In December people were buying Bird Vibes as stocking stuffers, 6 to 10 packages at a time. So I decided to find a publisher and Baico Books and Publishing in Ottawa worked with me for another larger print run in December. How did the creative process work for these cards? I work as an associate to Julie Desmarais in Ottawa, who taught me Holographic Reiki, and to really seeing the meaning of totems, metaphors, and archetypes, the language of Source that we often don’t recognize. 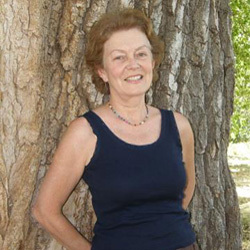 When I first met Julie, a gifted visionary, she immediately “saw” a hawk on my shoulder and said that I was a messenger. I have a master’s degree in Canadian Studies, with literature as the primary discipline, so the metaphors, symbolism and archetypes that are such an integral part of Holographic Reiki resonated with me, and I realized I could combine my Reiki with my love of birds and bring spiritual messages to people in a new way. The factual part of the messages had to be researched, to ensure complete accuracy. The spiritual part came easily. Whenever I felt blocked, I just sat back and asked for help from Source, and the words came. I revised and edited, but the essence of the message that I first wrote always stayed. It did seem that my mother, who has passed over, was there with me when I was working on them. And whenever I hear that someone has bought Bird Vibes for a cancer patient, or given them to someone who needed some comfort, I think that my mother had a hand in it, because she was a very caring, gentle soul. 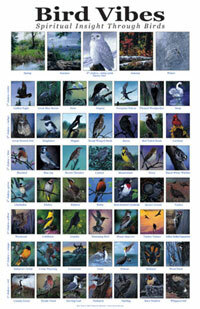 The hardest part was choosing the birds – there are so many wonderful birds. So I had a few criteria – for example, I had to not only have seen the bird, but to have either seen it repeatedly or had some special moment with it. After that I chose birds that fit into the chakras for one quality or another; for example, the Canada Goose in the first chakra, representing the tribe and the collectivity; the song birds in the 5th or Throat Chakra for their voice; the hawks in the 6th Chakra, the 3rd Eye, for their vision. The more narrow choices, such as which song birds to include, were intuitive. My final choice was the Snowy Owl, which I added at the end when it flew right over my car where I was parked in the countryside. It seemed to be showing me that it, too, was to be included. The Snowy Owl is so magnificent that it alone represents the 8th chakra, and the soul, the power of pure potential. Catherine Bastedo is a born natural intuitive, close to nature and appreciative of the gifts of the earth and the beauty around us. She was raised in northwestern Ontario and resides in Gatineau, Quebec. 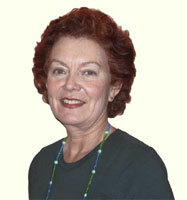 Catherine is certified as a Reiki Master and Holographic Energy Master and has been practicing Reiki since 1998. She has also trained in Quantum Touch and has collaborated with Julie Desmarais in teaching numerous Reiki and Holographic Energy classes. She is an associate of Julie Desmarais & Associates. 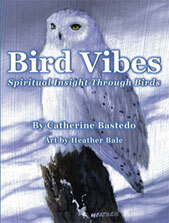 Catherine is the author of the inspirational card deck, Bird Vibes, a meditation deck to provide insight into current life situations by connecting with nature and the universal energy in us and around us.